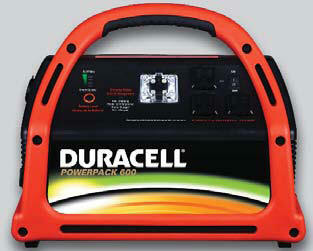 The Duracell® Powerpack 600 provides heavy duty household power anywhere. It operates demanding applications such as power tools, powers DC products that you enjoy during outdoor recreation, and provides emergency power during an outage at home. 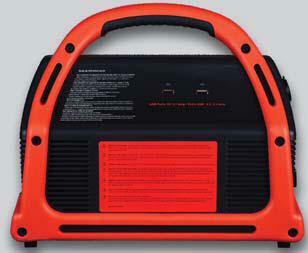 The Powerpack 600 is quiet, dependable and an easy-to-use power backup alternative to a generator, with added features including jumper cables. 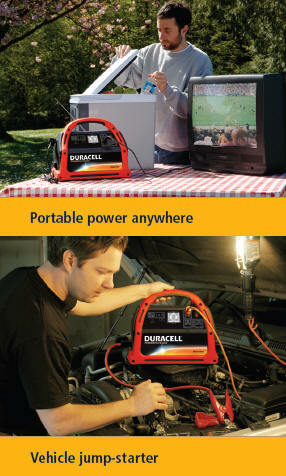 Whether it’s a job site or a camp site, the Duracell® Powerpack 600 is the ideal portable power solution. The Portable POWERPACK 600 battery backup can be conveniently recharged from any household AC wall outlet, or, a standard 12 VDC automobile cigarette lighter outlet. Runs 120-volt AC applications (three outlets) - three-pronged AC outlets (480-watt continuous / 600-watt peak) to power multiple devices, appliances and tools. Recharge at home or from a vehicle. Copyright © 2005-2012 StormPrepare, LLC. All rights reserved.